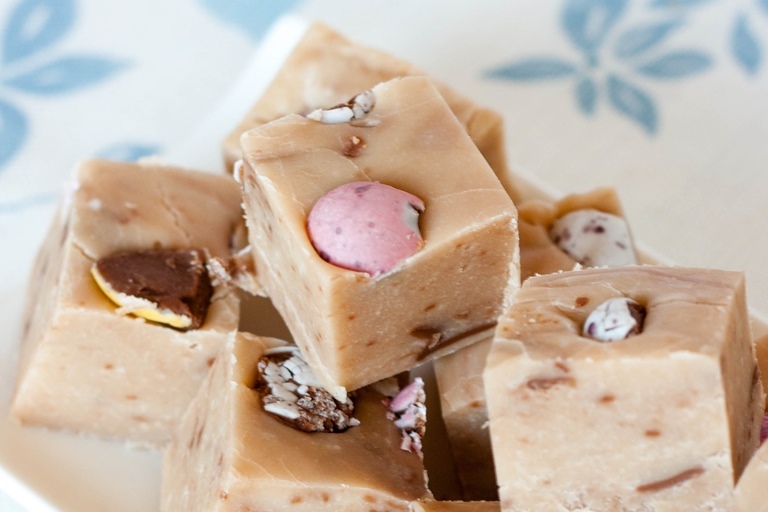 A delicious, soft, creamy and indulgent Creme Egg fudge - perfect for using up any squished eggs this Easter. This easy recipe will have your little ones jumping for joy. Cadbury’s Creme Eggs as we know them were first introduced in 1963, although Cadbury’s first sold a filled egg in 1923. Since then Creme eggs have become become a staple part of Easter – for many people Easter simply would be not Easter without them. Our tradition is to have one before lunch on Easter Sunday – I recommend washing them down with a glass of champagne; the combination of sweetness and dry fizz works remarkably well. Should an accident of the melting, or squashing type befall your Creme Eggs I recommend this delicious, soft, creamy and indulgent Creme Egg fudge, or treat yourself and make it anyway.